How are you celebrating this joyous day? Let us know all about your favorite holiday traditions. Whether you’ve been busy unwrapping gifts or eating sweet treats, we hope that you get the chance to spend some of the day enjoying the company of your family and friends. After all, there is no better time than now to celebrate the season with the ones you love most. And, if you have some time to spare during all your family festivities, don’t forget to stop by Eat My Dust to wish your team or rival racing pals the happiest of holidays! In honor of this special day , you might even want to challenge your pals to a few rounds on the track. Capture the Flag… and the Glory! Leaving rival drivers in your dust race after race can grow tiresome and may have you hungering for a different type of thrill. Take a break from the speedway, assemble a team of the most rugged drivers around, and head over to the Badlands for some classic Capture the Flag action with an Eat My Dust twist. Two teams, the white team and the blue team, have their own respective bases on opposite sides of the map, ready to face off. Each base houses a flag that must be protected from opponents trying to take it to their own base. Players have five minutes to protect their team’s flag and steal the opposing team’s flag as many times as possible. Whichever team scores the most points once the clock reaches zero wins. However, this would not be an Eat My Dust-caliber game if some chaos were not thrown into the mix. Just as drivers can fire weapons during races, the same holds true for Capture the Flag as drivers can shoot others to prevent them from returning a flag to base. Knock your enemies senseless as they attempt to return your team’s flag to their base but watch your own back since they will be returning the favor if you try to take off with theirs. Prove to your fellow drivers that you are not solely an individual force to be reckoned with but you can rally a dominating team as well. 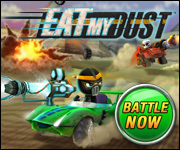 There is no better time than this upcoming Friday to showcase your skills as it is Capture the Flag Day in Eat My Dust. Assemble your team and prepare to face off against some of the nastiest opponents you will ever face. With a team backing you, the stakes are much higher than any race you will finish as the difference between victory and defeat relies upon your team’s ability to work together to overthrow your opponents. The competition is ready to slug it out, are you?